This summer we’re launching our first ever Summer Challenge for campaigners in England. The challenge we’re setting for thousands of our supporters is to take action locally to get your hospital testing all bowel cancer patients at diagnosis for Lynch syndrome - a genetic condition that increases the lifetime risk of bowel cancer to up to 80%. This is a chance for you to help make real change happen in your local area, as part of our Time to Test campaign. It’s been more than 18 months since the National Institute for Health and Care Excellence (NICE) recommended that all bowel cancer patients are tested for Lynch syndrome. But we’ve found in England only 17% of hospitals are testing all bowel cancer patients in line with clinical guidance because they don’t have the funds or enough staff to carry out testing. It’s vital people know when they have Lynch syndrome so they, and their family members, can take life-saving steps to reduce their chance of dying from bowel cancer. That’s why we need your help. This summer is the perfect opportunity to get started, as Parliament takes a break for recess. This means your MP should be spending time working in your local area, which is ideal as getting your MP on board with the campaign is the first step. This challenge is a fantastic way to get started if you’ve never campaigned before as we provide all the tools you need to feel confident. Or if you’re already in contact with your MP, it’s a great opportunity to follow up with them in person or contact local health bodies to tell them - it’s time to test. 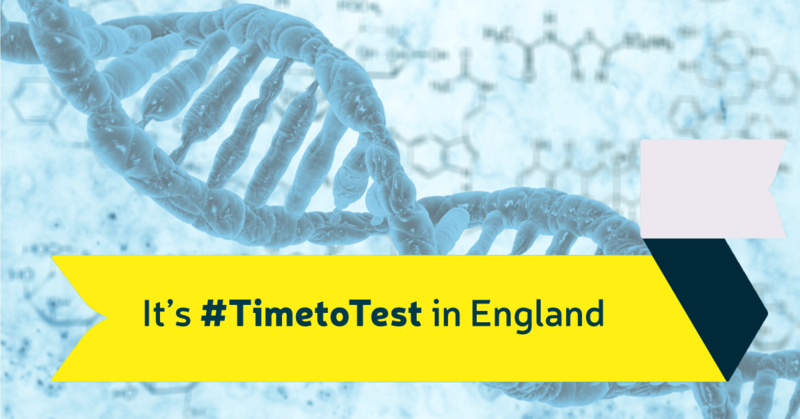 We've created a handy toolkit that tells you if your local hospital is testing, and gives you the support and knowledge you need to take action locally, to ensure everyone has equal access to this life-saving test. Step 1: Contact the people with the power – get in touch your local MP, Clinical Commissioning Group and Health Watch to get this issue on their agenda. Step 2: Inspire others locally to join the campaign – share your personal story and the campaign online to inspire other to join. Step 3: Make noise publicly – use the media to get the campaign message out there and get your voice heard. Thanks to our amazing campaigners who’ve taken action on the campaign over the years, we've taken huge steps towards identifying the 95% of people who don’t know they have Lynch syndrome. Last year NICE – that’s the organisation that provides clinical guidance to the NHS – introduced recommendations that everyone diagnosed with bowel cancer should be tested for Lynch syndrome. This wouldn’t have happened without you so we’d like to say a massive thank you for your support so far. But there's still so much more to do to make sure everyone has access to this life saving test. Join us and take action. Because together we can help save lives today.